We are a prominent company in the field of manufacture and supply of Reciprocating Pumps such as Reciprocating High Pressure Pumps. These pumps are manufactured by our trusted expert by using high quality of raw materials. These pumps are useful in many applications in the industries. Finally, these are available in different ranges, sizes and dimensions as per our valuable customers. Our company has been highly acclaimed in the domain of manufacturing and supplying of Reciprocating High Pressure Pumps. These pumps use a cylindrical mechanism to create a reciprocating motion along an axis, which then builds pressure in a cylinder to force fluid through the pump. 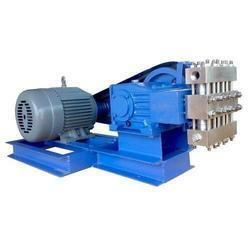 In addition, these pumps are offered in various customer specifications. To add on, these pumps are offered at nominal prices to our beloved clients.